Chinese punctuation uses a different set of punctuation marks from European languages, although the concept of modern standard punctuation was adapted in the written language during the 20th century from Western punctuation marks. Before that, the concept of punctuation in Chinese literature existed mainly in the form of Judou (simplified Chinese: 句读; traditional Chinese: 句讀; pinyin: jù dòu; literally: 'sentences and clauses'), a system of punctuation marks denoting stops and pauses, though many works of poetry and prose, as well as nearly all calligraphic works, omitted Judou marks, for in most occasions, it was not necessary to understanding meaning. 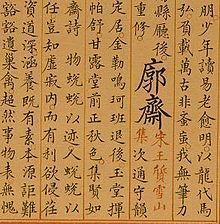 The first book to be printed with modern punctuation was Outline of the History of Chinese Philosophy (中國哲學史大綱) by Hu Shi (胡適), published in 1919. Traditional poetry and calligraphy maintains the punctuation-free style. The usage of punctuation is regulated by the Chinese national standard GB/T 15834–2011 "General rules for punctuation" (traditional Chinese: 標點符號用法; simplified Chinese: 标点符号用法; pinyin: biāodiǎn fúhào yòngfǎ). Many ancient Chinese books contain thousands of words with no spaces between them; however, when necessary to explicitly denote a pause or break, Judou marks such as "。" and "、" were used. Similar to the development of punctuation in Europe, there were varying types of Judou marks. For instance, a Song Dynasty print of Chronicles of Huayang used full-width spaces to denote a stop, whereas a print of Jingdian Shiwen from the same dynasty simply used "。" and "、" marks. Also, Qu Yuan's Li Sao used the character 兮 and grammatical particles to denote stops, similar to Judou marks. In Chinese writing, each character conforms to a roughly square frame so that the text as a whole can fit into a grid. Because of this, East Asian punctuation marks are larger than their European counterparts, as they should occupy a square area that is the same size as the characters around them. These punctuation marks are called fullwidth to contrast them from halfwidth European punctuation marks. Chinese characters can be written horizontally or vertically. Some punctuation marks adapt to this change in direction: the parentheses, square brackets, square quotation marks, book title marks, ellipsis marks, and dashes all rotate 90° clockwise when used in vertical text. The three underline-like punctuation marks in Chinese (proper noun mark, wavy book title mark, and emphasis mark) rotate and shift to the left side of the text in vertical script (shifting to the right side of the text is also possible, but this is outmoded and can clash with the placement of other punctuation marks). ， (U+FF0C FULLWIDTH COMMA) is the comma (,). It cannot be used for enumerating a list; see "enumeration comma" below. ！ (U+FF01 FULLWIDTH EXCLAMATION MARK) is the exclamation mark (!). ？ (U+FF1F FULLWIDTH QUESTION MARK) is the question mark (?). ； (U+FF1B FULLWIDTH SEMICOLON) is the semicolon (;). ： (U+FF1A FULLWIDTH COLON) is the colon (:). （ ） (U+FF08 FULLWIDTH LEFT PARENTHESIS), (U+FF09 FULLWIDTH RIGHT PARENTHESIS) are parentheses (round brackets). The Chinese full stop (U+3002 IDEOGRAPHIC FULL STOP) is a fullwidth small circle (Chinese: 句號; pinyin: jùhào). In horizontal writing, the full stop is placed in the middle, however in Mainland China it is placed in the bottom left; in vertical writing, it is placed below and to the right of the last character (U+FE12 PRESENTATION FORM FOR VERTICAL IDEOGRAPHIC FULL STOP) in Mainland China, and in the middle in Taiwan, Hong Kong, and Macau. In Traditional Chinese, the double and single quotation marks are fullwidth 『 』 (U+300E LEFT WHITE CORNER BRACKET, U+300F RIGHT WHITE CORNER BRACKET) and 「 」 (U+300C LEFT CORNER BRACKET, U+300D RIGHT CORNER BRACKET). The double quotation marks are used when embedded within single quotation marks: 「…『…』…」. In vertical text, quotation marks are rotated 90° clockwise (﹁﹂ (U+FE41 PRESENTATION FORM FOR VERTICAL LEFT ANGLE BRACKET, U+FE42 PRESENTATION FORM FOR VERTICAL RIGHT CORNER BRACKET)). In Simplified Chinese, the European-style quotation marks are always used in horizontal text. Here, single quotation marks are used when embedded within double quotation marks: “…‘…’…”. These quotation marks are fullwidth in printed matter but share the same codepoints as the European quotation marks in Unicode, so they require a Chinese-language font to be displayed correctly. In vertical text, corner brackets rotated 90° clockwise (﹁﹂), are used as in Traditional Chinese. Although Simplified Chinese is usually written horizontally, corner brackets are commonly encountered in vertically-printed newspaper headlines. A sign in a Zhuhai park, which, if we reproduce enumeration commas in English, can be rendered nearly word-for-word as: "It is strictly forbidden to pick flowers、 leaves、 fruit, [or to] dig out roots、 medicinal plants!" The enumeration comma (U+3001 IDEOGRAPHIC COMMA) or "dun comma" (Chinese: 頓號; pinyin: dùnhào; literally: 'pause mark') must be used instead of the regular comma when separating words constituting a list. Chinese language does not traditionally observe the English custom of a serial comma (the comma before and or or in a list), although the issue is of little consequence in Chinese at any rate, as the English "A, B, and C" is more likely to be rendered in Chinese as "A、B及C" or more often as "A、B、C", without any word for "and", see picture to the right. Chinese uses a middle dot to separate characters in non-Han personal names, such as Tibetan, Uyghur, etc. For example "Nur Bekri" ( نۇر بەكرى;), the name of a Chinese politician of Uyghur extraction is rendered as "努爾•白克力" . "Leonardo da Vinci" is often transcribed to Mandarin as: Chinese: 李奧納多‧達‧文西. The middle dot is also fullwidth in printed matter, while the halfwidth middle dot (·) is also used in computer input, which is then rendered as fullwidth in Chinese-language fonts. In Taiwan, the hyphenation point (‧) (U+2027 HYPHENATION POINT) is used instead for the same purpose. For titles of books, films, and so on, Chinese uses fullwidth double angle brackets 《…》 (U+300A LEFT DOUBLE ANGLE BRACKET, U+300B RIGHT DOUBLE ANGLE BRACKET), and fullwidth single angle brackets, 〈…〉 (U+3008 LEFT ANGLE BRACKET, U+3009 RIGHT ANGLE BRACKET). The latter is used when embedded within the former: 《…〈…〉…》. In Traditional Chinese, single title marks are also used for articles in or sections of a book whereas Simplified Chinese used double title marks for all titles. ﹏﹏﹏ (wavy underline, U+FE4F WAVY LOW LINE) is also used as a title mark. In Chinese, the ellipsis is written with six dots (not three) occupying the same space as two characters in the center of a line. Unicode provides an explicitly centered U+22EF MIDLINE HORIZONTAL ELLIPSIS (⋯) character in addition to the inexplicit U+2026 HORIZONTAL ELLIPSIS (…) character. Similarly, the em dash is written so that it occupies the space of two characters in the center of the line. There should be no breaking in the line. Chinese dash is Chinese: 破折號; pinyin: pòzhéhào. When connecting two words to signify a range, Chinese generally uses a full-width en dash occupying the space of one character (e.g. 1月—7月 "January to July", which can also be written 1月到7月, with the character 到 in place of the dash). A single em dash character, or a tilde may also be used. The wavy dash (U+FF5E WAVE DASH[A]) can also signify a range in Chinese (e.g. 5～20個字 "5 to 20 words"). It is more commonly but not exclusively used when the numbers are estimates (e.g. circa dates and temperatures in weather forecasts). For the most part, however, the en dash and wavy dash are interchangeable; usage is largely a matter of personal taste or institutional style. In informal use (such as texting), wavy dashes are also used to indicate a prolonged vowel similar to informal English's repeated letters (e.g. 哇～～ "waaah") or to indicate stress in places where English would employ an emphatic tone marked variously by italics or bolding (e.g. 要～～ "I want it"). Similar to the spacing between letters (kerning) in European languages, Chinese writing uses a very narrow space between characters, though it does not observe the equivalent to the wider space between words except on rare occasions. Chinese—particularly classical Chinese—is thus a form of scriptio continua and it is common for words to be split between lines with no marking in the text equivalent to the English hyphen. When a space is used, it is also fullwidth (U+3000 IDEOGRAPHIC SPACE). One instance of its usage is as an honorific marker. A modern example in 20th century Taiwan, is found in the reference to Chiang Kai-shek as 先總統　蔣公 (Former President, Lord Chiang), in which the preceding space serves as an honorific marker for 蔣公. This use is also still current in very formal letters or other old-style documents, as well as religious scripture. When Chinese is romanized, spaces are used to assist in reading. Rules vary between systems but most commonly—as in Hanyu Pinyin—the spaces properly occur between semantic divisions (i.e., words) but in practice are often placed between phonetic divisions (i.e., individual characters). In the Wade-Giles system, separate characters within a word were noted by hyphens but this is increasingly uncommon. The following are commonly suggested typographical styles; however, they are rarely carried out in practice, often only used when necessary. Proper name marks and title marks are used mainly in textbooks and official documents in Hong Kong, Macau, and Taiwan. A proper name mark (an underline) is occasionally used, especially in teaching materials and some movie subtitles. When the text runs vertically, the proper name mark is written as a line to the left of the characters (to the right in some older books). A title mark is a wavy underline (﹏﹏, U+FE4F WAVY LOW LINE) which is used instead of the regular book title marks whenever the proper noun mark is used in the same text. For emphasis, Chinese uses emphasis marks instead of italic type. Each emphasis mark is a single dot placed under each character to be emphasized (for vertical text, the dot is placed to the right hand side of each character). Although frequent in printed matter, emphasis marks are rare online, as they are not supported by most word processors, and support in HTML is in development. There is no equivalent of the apostrophe in Chinese. It is omitted in translated foreign names such as "O'Neill". The hyphen is only used when writing translated foreign names with hyphens. Otherwise, it is not used in Chinese and omitted when translating compound words. Several punctuation marks have ranges of use that differ from the way they are used in English, though some functions may overlap. ， The comma is used to join together clauses that deal with a certain topic or line of thinking. As such, what would appear to an English speaker to be a comma splice is very commonly seen in Chinese writing. Often, the entirety of a long paragraph can consist of clauses joined by commas, with the sole period coming only at the end. Unlike in English, a comma is allowed between a subject and its predicate. ； The semicolon is frequently used to demarcate parallel structures in a paragraph. 「…」 Quotation marks, in addition to being used around quotations, are also commonly used for emphasis and to indicate proper nouns and titles. — — The use of a second em dash to close a parenthetical thought is rare. Instead, a comma is usually used, or sometimes no punctuation at all. In Pinyin, the apostrophe (') (隔音符號, géyīn fúhào, 'syllable-dividing mark') is before a syllable starting with a vowel (a, o, or e) in a multiple-syllable word when the syllable does not start the word. It is commonly thought that this apostrophe should be used when there could be ambiguity regarding the syllables used (e.g. xian and xi'an or bing'an and bin'gan). ^ a b c "《中华人民共和国国家标准 GB/T 15834–2011〈标点符号用法〉》" [General rules for punctuation] (PDF). 中华人民共和国国家质量监督检验检疫总局；中国国家标准化管理委员会. 2011-12-30. Retrieved 2014-01-24. ^ "网页发生错误". so.gushiwen.org (in Chinese). Retrieved 2019-02-12. ^ "Halfwidth and Fullwidth Forms" (PDF). The Unicode Consortium. 2015-06-17. Retrieved 9 February 2016. This file contains an excerpt from ... Unicode Standard, Version 8.0. ^ a b c d e f g h "CJK Symbols and Punctuation" (PDF). The Unicode Consortium. 2015-06-17. Retrieved 9 February 2016. This file contains an excerpt from ... Unicode Standard, Version 8.0. ^ a b c "CJK Compatibility Forms" (PDF). The Unicode Consortium. 2015-06-17. Retrieved 9 February 2016. This file contains an excerpt from ... Unicode Standard, Version 8.0. ^ "General Punctuation" (PDF). The Unicode Consortium. 2015-06-17. Retrieved 9 February 2016. This file contains an excerpt from ... Unicode Standard, Version 8.0. ^ "CJK Symbols and Punctuation" (PDF). The Unicode Consortium. Retrieved 6 November 2009. ^ "刪節號". （台灣）教育部. Retrieved 2018-03-01. ^ "Mathematical Operators: Range: 2200–22FF: Page 7" (PDF). Unicode Consortium. Retrieved 2018-03-01. ^ "General Punctuation: Range: 2000–206F: Page 4" (PDF). Unicode Consortium. Retrieved 2018-03-01. ^ Tung, Bobby. "Requirements for Chinese Text Layout". W3C. Retrieved 1 May 2016.